Total War: Warhammer; the first in a new trilogy of Total War games that will take the series out of its roots in historical settings and plunge it into a fantasy world filled with monsters, magic and mayhem, for a Total War experience that will truly be unlike any other. Set for release in 2016, Total War: Warhammer will be tenth title in the Total War series and shall combine the turn based strategy and real time combat that we've come to know and love, with the dark and chaotic Warhammer universe created by Games Workshop. As the game is still in the early stages of development, we don't have yet a full overview about; however, what we have seen so far is enough to make our mouth water and the premises are simply awesome. Let's get a look on what we have got so far then! This new game will play host to a variety of exciting new features and mechanics and, while we have yet to hear about the vampire counts and their undead hordes, the Dwarf, Greenskin and Empire factions have received much coverage. 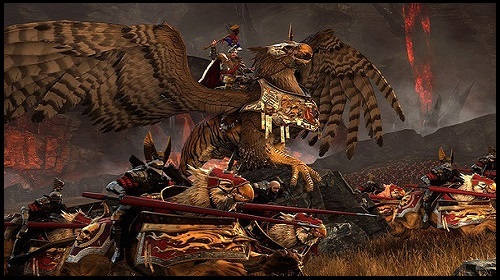 One of the first factions we got a good look at was the Empire with their leader, the legendary Karl Franz; an Emperor who rides to battle atop his Griffon mount. The units of this faction are closest to what might usually be seen in a Total War game by virtue of the fact that they are at least human. The Empire fields the usual roster of pike, melee and ranged gun units, coupled with both heavy and ranged cavalry, that might be considered more 'normal' to a TW gamer. This faction does not lack its fair share of unusual features and units, however; Demigryph knights take to the field as extremely heavy shock cavalry, whose mounts pack as much punch as their riders; alongside these we see large tanks and cannons appear as heavy artillery, although perhaps one of the more interesting additions are the spellcasters, powerful wizards with the ability to cast a number of spells which can cause massive damage to packed formations of enemy units. From what has been seen so far, the forces the empire wields are versatile and fairly strong across the board, well able to stand their ground in a fight however, in the face of some of the more monstrous units fielded by the other factions, they can be hard-pressed to achieve victory. Following on from this, we get the Greenskin faction whose units are pretty much furthest removed from what we have come to expect in a Total War game. One of the greatest examples of this being the introduction of 'Doom-diver' catapults, contraptions with the ability to fire fanatic goblins across the length of the battlefield and into enemy ranks; the fact that you also get to pilot these fanatics as they plunge to their deaths provides even more excitement to the first person view attainable with ranged units in previous games. The backbone of a Greenskin army is made up of large hordes of insatiable goblin and orc troops, hungry for blood and battle. Even more so terrifying (especially to an arachnophobe) are the mounts upon which some of these units ride to war; large spiders which terrorise the battlefield and are sure to strike fear into the hearts of any foe. 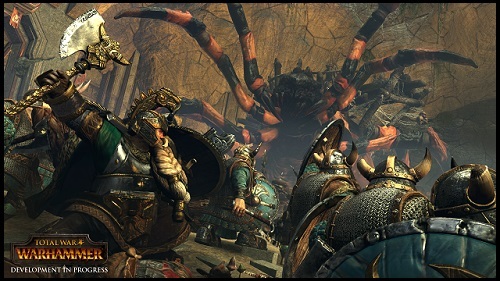 With the Greenskins gigantic and powerful monsters are what truly sets them apart; Arachnarok spiders, eight legged war-machines which tower over the battlefield make an appearance alongside Giants and Trolls. The Greenskins are not without magic either as Shamans build up their Waaagh! and let lose powerful spells with large AoE damage. With the Greenskins it is not about formations, tactics and order, it is about throwing as much as you can at the enemy and waiting for them to crumble in the face of an overwhelming and monstrous onslaught. What they lack in discipline they make up for in bloodthirstiness and appear to favour a more offensive playing style. Uh uh.. too much flies there? Finally we come to the Dwarfs and, as you'd expect from this faction they can truly pack a punch in terms of artillery and ranged units, being better defensively than the other factions. What this faction lacks in magic and monstrous creatures they make up for in their engineering with Girocopters taking to the skies to pick off enemy units from afar or, if you're feeling particularly malicious, to drop bombs right on top of them with devastating effect. Under the command of High King Thorgrim Grudgebearer, the Dwarfs are a proud race whose goal it is to right the many wrongs they perceive have been committed against them. Ornate and deadly axes and war-hammers are their preferred weapons as they suit the fighting style of the powerfully built Dwarfen troops better than the the sharper, stabbing weapons utilised by other races. The Dwarfs field an impressive array of Artillery which more than make up for their lack of stature, powerful cannons and guns able to pepper the battlefield with both bullets and bombs make an appearance whilst heavy flamethrowers can turn the tide of battle in their favour with one scorching blast. Dwarfen ranged units are not too weak in melee fighting either, able to hold their own when under attack due to their heavy armour and good training. 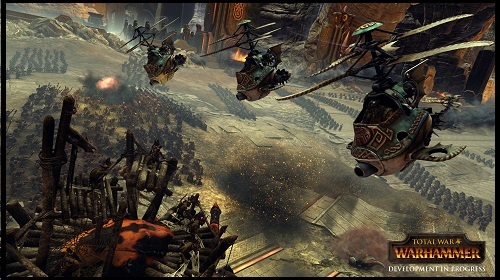 As has been mentioned in battle the Dwarfs do favour a defensive style and with few exceptions, such as the Girocopters and the lightly armoured Slayers, have not got the maneuverability of units belonging to other factions being overall slower. 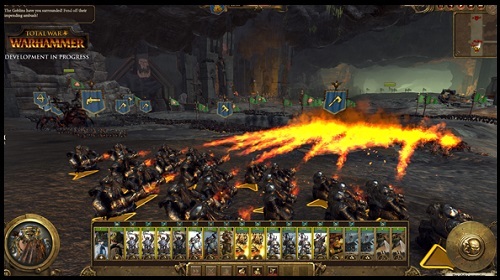 All in all Dwarfen units are a formidable force with soldiers adapted for a whole variety of functions such as taking down large monsters to cutting through large swathes of enemy units making their armies unique in their own right. Mmmm we like it crispy! New features are not just limited to the units of the game as new mechanics have been incorporated across the board. As you may have noticed with the mentioning of Girocopters and Griffons the skies themselves have become a battlefield and dominance in the air may become a necessity to ensure an armies victory. Furthermore battlefields have undergone a fantastical transformation, bringing them further in line with the Warhammer universe, meaning your troops might now be fighting against a backdrop of lava flows rather than the run of the mill plains and forests we've come to expect from TW games. Perhaps most exciting of all is the addition of underground battles which you'll be able to fight when playing the game providing players with new challenges they'll have to overcome; when you're walled in on both sides, outmaneuvering an enemy might become an even more difficult task, whilst ambushes from side-passages may leave you struggling to survive. Hero and Champion units also get an overhaul, agents that once only made an appearance on the campaign map can now be utilised in battle as elite troops, unnamed agents might fall like any other troop whilst the most elite such as each of the faction leaders can be revived and used again and again making them a valuable asset. Another addition are quest like missions which are available for each faction, although little information on this has been given so far. What to ask more from a battlefield? Although we have seen a lot in recent months, there's still very little we know about the campaign map itself and any new features instituted there. While it can be expected that the mechanics for city building will differ little from previous titles there may be much more disparity between the styles of buildings and how cities look on the campaign map between factions due to the major differences between each of the races. For example the chaotic Greenskins are unlikely to have the same building abilities as the orderly empire or the brilliant miners and architects of the Dwarfs and so vastly different tactics are going to be required when taking or defending a city depending on the faction you are playing. Furthermore diplomacy is unlikely to see too much change, although perhaps with the ancient enmities between certain factions it may be more difficult to successfully broker peace or gain a much needed trade agreement. Little information is yet available on other factions that may appear in game, the Warhammer universe contains a whole host of different races and it may be interesting to see what other factions and units will make an appearance, if any. As a final note, the information here is what I have gleaned from the videos released by Creative Assembly (such as the The making of the announcement trailer) and as this game is still in production much may have changed by the time it appears on shelves/steam store. From what I've seen so far, however, this is shaping up to be a good addition to the Total War series with some well rounded and interesting factions and features. Hopefully we'll soon get some news on the Vampires and I'll make sure to keep you all updated on what's promising to be the most unique and extraordinary Total War game yet. Thanks Flinn and Dark Storm it's a good one, btw is there any such preview/review for Arena yet? Great preview! It sounds like TW: Warhammer battle-fields will be exciting and terrifying places! 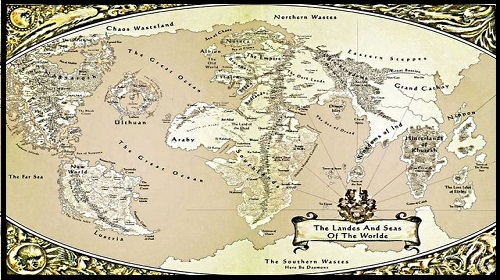 (The links to information are helpful for me, as I know virtually nothing about the amazing world of Warhammer.) I didn't know that TW: Warhammer will be the first of a trilogy, I wonder what the second and third installment will be? Ahh you can buy it later at holiday season where usually total war get discount. Only on warhammer we can have all element from supernatural , human, machines all mixed into one flavour. Its realy been tired fighting human over and over. Need some different taste. How about siege by undead, zombie , skeleton march into your gate. Complete with dragon perhaps terror from above all made the warhammer into something that MUST have !! !